The Universe is all of space and time[a] and their contents, including planets, stars, galaxies, and all other forms of matter and energy. While the spatial size of the entire Universe is unknown, it is possible to measure the size of the observable universe, which is currently estimated to be 93 billion light years in diameter. In various multiverse hypotheses, a universe is one of many causally disconnected constituent parts of a larger multiverse, which itself comprises all of space and time and its contents. The earliest scientific models of the Universe were developed by ancient Greek and Indian philosophers and were geocentric, placing Earth at the center of the Universe. Over the centuries, more precise astronomical observations led Nicolaus Copernicus to develop the heliocentric model with the Sun at the center of the Solar System. In developing the law of universal gravitation, Isaac Newton built upon Copernicus' work as well as observations by Tycho Brahe and Johannes Kepler's laws of planetary motion. Further observational improvements led to the realization that the Sun is one of hundreds of billions of stars in the Milky Way, which is one of at least hundreds of billions of galaxies in the Universe. Many of the stars in our galaxy have planets. At the largest scale galaxies are distributed uniformly and the same in all directions, meaning that the Universe has neither an edge nor a center. At smaller scales, galaxies are distributed in clusters and superclusters which form immense filaments and voids in space, creating a vast foam-like structure. Discoveries in the early 20th century have suggested that the Universe had a beginning and that space has been expanding since then, and is currently still expanding at an increasing rate. The Big Bang theory is the prevailing cosmological description of the development of the Universe. Under this theory, space and time emerged together 7001137990000000000♠13.799±0.021 billion years ago and the energy and matter initially present have become less dense as the Universe expanded. 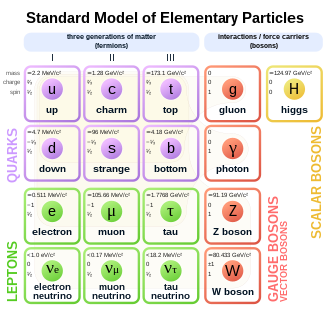 After an initial accelerated expansion called the inflationary epoch at around 10−32 seconds, and the separation of the four known fundamental forces, the Universe gradually cooled and continued to expand, allowing the first subatomic particles and simple atoms to form. Dark matter gradually gathered forming a foam-like structure of filaments and voids under the influence of gravity. Giant clouds of hydrogen and helium were gradually drawn to the places where dark matter was most dense, forming the first galaxies, stars, and everything else seen today. It is possible to see objects that are now further away than 13.799 billion light-years because space itself has expanded, and it is still expanding today. This means that objects which are now up to 46.5 billion light-years away can still be seen in their distant past, because in the past when their light was emitted, they were much closer to the Earth. From studying the movement of galaxies, it has been discovered that the universe contains much more matter than is accounted for by visible objects; stars, galaxies, nebulas and interstellar gas. This unseen matter is known as dark matter (dark means that there is a wide range of strong indirect evidence that it exists, but we have not yet detected it directly). 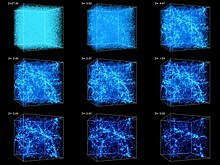 The ΛCDM model is the most widely accepted model of our universe. It suggests that about 6999692000000000000♠69.2%±1.2%  of the mass and energy in the universe is a cosmological constant (or, in extensions to ΛCDM, other forms of dark energy such as a scalar field) which is responsible for the current expansion of space, and about 6999258000000000000♠25.8%±1.1%  is dark matter. Ordinary ("baryonic") matter is therefore only 4.9%  of the physical universe. Stars, planets, and visible gas clouds only form about 6% of ordinary matter, or about 0.3% of the entire universe. There are many competing hypotheses about the ultimate fate of the universe and about what, if anything, preceded the Big Bang, while other physicists and philosophers refuse to speculate, doubting that information about prior states will ever be accessible. Some physicists have suggested various multiverse hypotheses, in which our universe might be one among many universes that likewise exist. The physical Universe is defined as all of space and time[a] (collectively referred to as spacetime) and their contents. Such contents comprise all of energy in its various forms, including electromagnetic radiation and matter, and therefore planets, moons, stars, galaxies, and the contents of intergalactic space. The Universe also includes the physical laws that influence energy and matter, such as conservation laws, classical mechanics, and relativity. This diagram shows Earth's location in the Universe on increasingly larger scales. The images, labeled along their left edge, increase in size from right to left, then from top to bottom. The proper distance—the distance as would be measured at a specific time, including the present—between Earth and the edge of the observable universe is 46 billion light-years (14 billion parsecs), making the diameter of the observable universe about 93 billion light-years (28 billion parsecs). The distance the light from the edge of the observable universe has travelled is very close to the age of the Universe times the speed of light, 13.8 billion light-years (4.2×10^9 pc), but this does not represent the distance at any given time because the edge of the observable universe and the Earth have since moved further apart. For comparison, the diameter of a typical galaxy is 30,000 light-years (9,198 parsecs), and the typical distance between two neighboring galaxies is 3 million light-years (919.8 kiloparsecs). As an example, the Milky Way is roughly 100,000–180,000 light-years in diameter, and the nearest sister galaxy to the Milky Way, the Andromeda Galaxy, is located roughly 2.5 million light-years away. Astronomers discovered stars in the Milky Way galaxy that are almost 13.6 billion years old. Over time, the Universe and its contents have evolved; for example, the relative population of quasars and galaxies has changed and space itself has expanded. Due to this expansion, scientists on Earth can observe the light from a galaxy 30 billion light-years away even though that light has traveled for only 13 billion years; the very space between them has expanded. This expansion is consistent with the observation that the light from distant galaxies has been redshifted; the photons emitted have been stretched to longer wavelengths and lower frequency during their journey. Analyses of Type Ia supernovae indicate that the spatial expansion is accelerating. has been positive in the last 5-6 billion years. This acceleration does not, however, imply that the Hubble parameter is currently increasing; see deceleration parameter for details. The Universe is composed almost completely of dark energy, dark matter, and ordinary matter. Other contents are electromagnetic radiation (estimated to constitute from 0.005% to close to 0.01% of the total mass-energy of the Universe) and antimatter. Matter, dark matter, and dark energy are distributed homogeneously throughout the Universe over length scales longer than 300 million light-years or so. However, over shorter length-scales, matter tends to clump hierarchically; many atoms are condensed into stars, most stars into galaxies, most galaxies into clusters, superclusters and, finally, large-scale galactic filaments. The observable Universe contains approximately 300 sextillion (3×1023) stars and more than 100 billion (1011) galaxies. Typical galaxies range from dwarfs with as few as ten million (107) stars up to giants with one trillion (1012) stars. Between the larger structures are voids, which are typically 10–150 Mpc (33 million–490 million ly) in diameter. The Milky Way is in the Local Group of galaxies, which in turn is in the Laniakea Supercluster. This supercluster spans over 500 million light-years, while the Local Group spans over 10 million light-years. The Universe also has vast regions of relative emptiness; the largest known void measures 1.8 billion ly (550 Mpc) across. The observable Universe is isotropic on scales significantly larger than superclusters, meaning that the statistical properties of the Universe are the same in all directions as observed from Earth. The Universe is bathed in highly isotropic microwave radiation that corresponds to a thermal equilibrium blackbody spectrum of roughly 2.72548 kelvins. The hypothesis that the large-scale Universe is homogeneous and isotropic is known as the cosmological principle. A Universe that is both homogeneous and isotropic looks the same from all vantage points and has no center. The solutions for R(t) depend on k and Λ, but some qualitative features of such solutions are general. First and most importantly, the length scale R of the Universe can remain constant only if the Universe is perfectly isotropic with positive curvature (k=1) and has one precise value of density everywhere, as first noted by Albert Einstein. However, this equilibrium is unstable: because the Universe is known to be inhomogeneous on smaller scales, R must change over time. When R changes, all the spatial distances in the Universe change in tandem; there is an overall expansion or contraction of space itself. This accounts for the observation that galaxies appear to be flying apart; the space between them is stretching. The stretching of space also accounts for the apparent paradox that two galaxies can be 40 billion light-years apart, although they started from the same point 13.8 billion years ago and never moved faster than the speed of light. Third, the curvature index k determines the sign of the mean spatial curvature of spacetime averaged over sufficiently large length scales (greater than about a billion light-years). If k=1, the curvature is positive and the Universe has a finite volume. 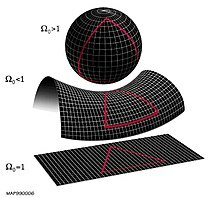 A Universe with positive curvature is often visualized as a three-dimensional sphere embedded in a four-dimensional space. Conversely, if k is zero or negative, the Universe has an infinite volume. It may seem counter-intuitive that an infinite and yet infinitely dense Universe could be created in a single instant at the Big Bang when R=0, but exactly that is predicted mathematically when k does not equal 1. By analogy, an infinite plane has zero curvature but infinite area, whereas an infinite cylinder is finite in one direction and a torus is finite in both. A toroidal Universe could behave like a normal Universe with periodic boundary conditions. Map of the observable universe with some of the notable astronomical objects known today. The scale of length increases exponentially toward the right. Celestial bodies are shown enlarged in size to be able to appreciate their shapes. ^ "Hubble sees galaxies galore". spacetelescope.org. Retrieved April 30, 2017. ^ a b c Planck Collaboration (2016). "Planck 2015 results. XIII. Cosmological parameters". Astronomy & Astrophysics. 594: A13, Table 4. arXiv:1502.01589. Bibcode:2016A&A...594A..13P. doi:10.1051/0004-6361/201525830. ^ a b c d Greene, Brian (2011). The Hidden Reality. Alfred A. Knopf. ^ Itzhak Bars; John Terning (November 2009). Extra Dimensions in Space and Time. Springer. pp. 27–. ISBN 978-0-387-77637-8. Retrieved May 1, 2011. ^ Paul Davies (2006). The Goldilocks Enigma. First Mariner Books. p. 43ff. ISBN 978-0-618-59226-5. ^ a b NASA/WMAP Science Team (January 24, 2014). "Universe 101: What is the Universe Made Of?". NASA. Retrieved February 17, 2015. ^ a b Fixsen, D.J. (2009). "The Temperature of the Cosmic Microwave Background". The Astrophysical Journal. 707 (2): 916–20. arXiv:0911.1955. Bibcode:2009ApJ...707..916F. doi:10.1088/0004-637X/707/2/916. ^ a b c "First Planck results: the Universe is still weird and interesting". Matthew Francis. Ars technica. March 21, 2013. Retrieved August 21, 2015. ^ NASA/WMAP Science Team (January 24, 2014). "Universe 101: Will the Universe expand forever?". NASA. Retrieved April 16, 2015. ^ a b Zeilik, Michael; Gregory, Stephen A. (1998). Introductory Astronomy & Astrophysics (4th ed.). Saunders College Publishing. ISBN 978-0-03-006228-5. The totality of all space and time; all that is, has been, and will be. ^ Carroll, Bradley W.; Ostlie, Dale A. (July 23, 2013). An Introduction to Modern Astrophysics (International ed.). Pearson. pp. 1173–74. ISBN 978-1-292-02293-2. ^ Hawking, Stephen (1988). A Brief History of Time. Bantam Books. p. 125. ISBN 978-0-553-05340-1. ^ a b "The Nobel Prize in Physics 2011". Retrieved April 16, 2015. ^ Redd, Nola. "What is Dark Matter?". Space.com. Retrieved February 1, 2018. ^ Persic, Massimo; Salucci, Paolo (September 1, 1992). "The baryon content of the Universe". Monthly Notices of the Royal Astronomical Society. 258 (1): 14P–18P. arXiv:astro-ph/0502178. Bibcode:1992MNRAS.258P..14P. doi:10.1093/mnras/258.1.14P. ISSN 0035-8711. : states "less than 10%" but also provides a more exact value of 0.3% of the universe, which is about 6% of baryonic matter [4.9% according to Planck 2015]. ^ a b c d e f g Ellis, George F.R. ; U. Kirchner; W.R. Stoeger (2004). "Multiverses and physical cosmology". Monthly Notices of the Royal Astronomical Society. 347 (3): 921–36. arXiv:astro-ph/0305292. Bibcode:2004MNRAS.347..921E. doi:10.1111/j.1365-2966.2004.07261.x. ^ Palmer, Jason. (August 3, 2011) BBC News – 'Multiverse' theory suggested by microwave background. Retrieved November 28, 2011. ^ "Universe". Encyclopaedia Britannica online. Encyclopaedia Britannica Inc. 2012. Retrieved February 17, 2018. ^ "Universe". Merriam-Webster Dictionary. Retrieved September 21, 2012. ^ "Universe". Dictionary.com. Retrieved September 21, 2012. ^ a b Duco A. Schreuder (December 3, 2014). Vision and Visual Perception. Archway Publishing. p. 135. ISBN 978-1-4808-1294-9. ^ Mermin, N. David (2004). "Could Feynman Have Said This?". Physics Today. 57 (5): 10. Bibcode:2004PhT....57e..10M. doi:10.1063/1.1768652. ^ Tegmark, Max (2008). "The Mathematical Universe". Foundations of Physics. 38 (2): 101–50. arXiv:0704.0646. Bibcode:2008FoPh...38..101T. doi:10.1007/s10701-007-9186-9. A short version of which is available at Fixsen, D. J. (2007). "Shut up and calculate". arXiv:0709.4024 [physics.pop-ph]. in reference to David Mermin's famous quote "shut up and calculate!" ^ Jim Holt (2012). Why Does the World Exist?. Liveright Publishing. p. 308. ^ Timothy Ferris (1997). The Whole Shebang: A State-of-the-Universe(s) Report. Simon & Schuster. p. 400. ^ Paul Copan; William Lane Craig (2004). Creation Out of Nothing: A Biblical, Philosophical, and Scientific Exploration. Baker Academic. p. 220. ISBN 978-0-8010-2733-8. ^ Alexander Bolonkin (November 2011). Universe, Human Immortality and Future Human Evaluation. Elsevier. pp. 3–. ISBN 978-0-12-415801-6. ^ Lewis, C.T. and Short, S (1879) A Latin Dictionary, Oxford University Press, ISBN 0-19-864201-6, pp. 1933, 1977–1978. ^ Lewis, C.T. ; Short, S (1879). A Latin Dictionary. Oxford University Press. pp. 1175, 1189–90, 1881–82. ISBN 978-0-19-864201-5. ^ The Compact Edition of the Oxford English Dictionary. II. Oxford: Oxford University Press. 1971. pp. 569, 909, 1900, 3821–22. ISBN 978-0-19-861117-2. ^ Joseph Silk (2009). Horizons of Cosmology. Templeton Pressr. p. 208. ^ Simon Singh (2005). Big Bang: The Origin of the Universe. Harper Perennial. p. 560. Bibcode:2004biba.book.....S.
^ C. Sivaram (1986). "Evolution of the Universe through the Planck epoch". Astrophysics and Space Science. 125 (1): 189–99. Bibcode:1986Ap&SS.125..189S. doi:10.1007/BF00643984. ^ Richard B. Larson & Volker Bromm (March 2002). "The First Stars in the Universe". Scientific American. ^ "Antimatter". Particle Physics and Astronomy Research Council. October 28, 2003. Archived from the original on March 7, 2004. Retrieved August 10, 2006. ^ Adamson, Allan (October 19, 2017). "Universe Should Not Actually Exist: Big Bang Produced Equal Amounts Of Matter And Antimatter". TechTimes.com. Retrieved October 26, 2017. ^ Smorra C.; et al. (October 20, 2017). "A parts-per-billion measurement of the antiproton magnetic moment". Nature. 550 (7676): 371–74. Bibcode:2017Natur.550..371S. doi:10.1038/nature24048. PMID 29052625. ^ Michio Kaku (March 11, 2008). Physics of the Impossible: A Scientific Exploration into the World of Phasers, Force Fields, Teleportation, and Time Travel. Knopf Doubleday Publishing Group. pp. 202–. ISBN 978-0-385-52544-2. ^ a b Itzhak Bars; John Terning (October 19, 2018). Extra Dimensions in Space and Time. Springer. pp. 27–. ISBN 978-0-387-77637-8. Retrieved October 19, 2018. ^ "WolframAlpha". Retrieved October 19, 2018. ^ Christopher Crockett (February 20, 2013). "What is a light-year?". EarthSky. ^ Christian, Eric; Samar, Safi-Harb. "How large is the Milky Way?". Retrieved November 28, 2007. ^ Hall, Shannon (May 4, 2015). "Size of the Milky Way Upgraded, Solving Galaxy Puzzle". Space.com. Retrieved June 9, 2015. ^ I. Ribas; C. Jordi; F. Vilardell; E.L. Fitzpatrick; R.W. Hilditch; F. Edward Guinan (2005). "First Determination of the Distance and Fundamental Properties of an Eclipsing Binary in the Andromeda Galaxy". Astrophysical Journal. 635 (1): L37–L40. arXiv:astro-ph/0511045. Bibcode:2005ApJ...635L..37R. doi:10.1086/499161. McConnachie, A.W. ; Irwin, M.J.; Ferguson, A.M.N. ; Ibata, R.A.; Lewis, G.F.; Tanvir, N. (2005). "Distances and metallicities for 17 Local Group galaxies". Monthly Notices of the Royal Astronomical Society. 356 (4): 979–97. arXiv:astro-ph/0410489. Bibcode:2005MNRAS.356..979M. doi:10.1111/j.1365-2966.2004.08514.x. ^ "How can space travel faster than the speed of light?". Vannesa Janek. Universe Today. February 20, 2015. Retrieved June 6, 2015. ^ "Is faster-than-light travel or communication possible? Section: Expansion of the Universe". Philip Gibbs. 1997. Archived from the original on November 17, 2009. Retrieved June 6, 2015. ^ Phil Berardelli (March 25, 2010). "Galaxy Collisions Give Birth to Quasars". Science News. ^ Riess, Adam G.; Filippenko; Challis; Clocchiatti; Diercks; Garnavich; Gilliland; Hogan; Jha; Kirshner; Leibundgut; Phillips; Reiss; Schmidt; Schommer; Smith; Spyromilio; Stubbs; Suntzeff; Tonry (1998). "Observational evidence from supernovae for an accelerating universe and a cosmological constant". Astronomical Journal. 116 (3): 1009–38. arXiv:astro-ph/9805201. Bibcode:1998AJ....116.1009R. doi:10.1086/300499. ^ Perlmutter, S.; Aldering; Goldhaber; Knop; Nugent; Castro; Deustua; Fabbro; Goobar; Groom; Hook; Kim; Kim; Lee; Nunes; Pain; Pennypacker; Quimby; Lidman; Ellis; Irwin; McMahon; Ruiz‐Lapuente; Walton; Schaefer; Boyle; Filippenko; Matheson; Fruchter; et al. (1999). "Measurements of Omega and Lambda from 42 high redshift supernovae". Astrophysical Journal. 517 (2): 565–86. arXiv:astro-ph/9812133. Bibcode:1999ApJ...517..565P. doi:10.1086/307221. ^ Sean Carroll; Michio Kaku (2014). "End of the Universe". How the Universe Works. Discovery Channel. ^ Overbye, Dennis (October 11, 2003). "A 'Cosmic Jerk' That Reversed the Universe". New York Times. ^ Schutz, Bernard (May 31, 2009). A First Course in General Relativity (2 ed.). Cambridge University Press. pp. 142, 171. ISBN 978-0-521-88705-2. ^ a b Luminet, Jean-Pierre; Weeks, Jeffrey R.; Riazuelo, Alain; Lehoucq, Roland; Uzan, Jean-Philippe (October 9, 2003). "Dodecahedral space topology as an explanation for weak wide-angle temperature correlations in the cosmic microwave background". Nature (Submitted manuscript). 425 (6958): 593–95. arXiv:astro-ph/0310253. Bibcode:2003Natur.425..593L. doi:10.1038/nature01944. PMID 14534579. ^ Luminet, Jean-Pierre; Boudewijn F. Roukema (1999). "Topology of the Universe: Theory and Observations". Proceedings of Cosmology School held at Cargese, Corsica, August 1998. arXiv:astro-ph/9901364. Bibcode:1999ASIC..541..117L. ^ Brill, Dieter; Jacobsen, Ted (2006). "Spacetime and Euclidean geometry". General Relativity and Gravitation. 38 (4): 643–51. arXiv:gr-qc/0407022. Bibcode:2006GReGr..38..643B. CiteSeerX 10.1.1.338.7953. doi:10.1007/s10714-006-0254-9. ^ Edward Robert Harrison (2000). Cosmology: the science of the universe. Cambridge University Press. pp. 447–. ISBN 978-0-521-66148-5. Retrieved May 1, 2011. ^ Andrew R. Liddle; David Hilary Lyth (April 13, 2000). Cosmological inflation and large-scale structure. Cambridge University Press. pp. 24–. ISBN 978-0-521-57598-0. Retrieved May 1, 2011. ^ "What is the Ultimate Fate of the Universe?". National Aeronautics and Space Administration. NASA. Retrieved August 23, 2015. ^ Roukema, Boudewijn; Zbigniew Buliński; Agnieszka Szaniewska; Nicolas E. Gaudin (2008). "A test of the Poincare dodecahedral space topology hypothesis with the WMAP CMB data". Astronomy and Astrophysics. 482 (3): 747–53. arXiv:0801.0006. Bibcode:2008A&A...482..747L. doi:10.1051/0004-6361:20078777. ^ Aurich, Ralf; Lustig, S.; Steiner, F.; Then, H. (2004). "Hyperbolic Universes with a Horned Topology and the CMB Anisotropy". Classical and Quantum Gravity. 21 (21): 4901–26. arXiv:astro-ph/0403597. Bibcode:2004CQGra..21.4901A. doi:10.1088/0264-9381/21/21/010. ^ Planck collaboration (2014). "Planck 2013 results. XVI. Cosmological parameters". Astronomy & Astrophysics. 571: A16. arXiv:1303.5076. Bibcode:2014A&A...571A..16P. doi:10.1051/0004-6361/201321591. ^ "Planck reveals 'almost perfect' universe". Michael Banks. Physics World. March 21, 2013. Retrieved March 21, 2013. ^ Mark Isaak, ed. (2005). "CI301: The Anthropic Principle". Index to Creationist Claims. TalkOrigins Archive. Retrieved October 31, 2007. ^ Fritzsche, Hellmut. "electromagnetic radiation | physics". Encyclopædia Britannica. p. 1. Retrieved July 26, 2015. ^ "Physics 7:Relativity, SpaceTime and Cosmology" (PDF). Physics 7:Relativity, SpaceTime and Cosmology. University of California Riverside. Archived from the original (PDF) on September 5, 2015. Retrieved July 26, 2015. ^ "Physics – for the 21st Century". www.learner.org. Harvard-Smithsonian Center for Astrophysics Annenberg Learner. Retrieved July 27, 2015. ^ "Dark matter – A history shapes by dark force". Timothy Ferris. National Geographic. 2015. Retrieved December 29, 2015. ^ Redd, SPACE.com, Nola Taylor. "It's Official: The Universe Is Dying Slowly". Retrieved August 11, 2015. ^ Will Parr; et al. "RIP Universe – Your Time Is Coming… Slowly | Video". Space.com. Retrieved August 20, 2015. ^ a b Peebles, P.J. E. & Ratra, Bharat (2003). "The cosmological constant and dark energy". Reviews of Modern Physics. 75 (2): 559–606. arXiv:astro-ph/0207347. Bibcode:2003RvMP...75..559P. doi:10.1103/RevModPhys.75.559. ^ Mandolesi, N.; Calzolari, P.; Cortiglioni, S.; Delpino, F.; Sironi, G.; Inzani, P.; Deamici, G.; Solheim, J.-E.; Berger, L.; Partridge, R.B. ; Martenis, P.L. ; Sangree, C.H. ; Harvey, R.C. (1986). "Large-scale homogeneity of the Universe measured by the microwave background". Nature. 319 (6056): 751–53. Bibcode:1986Natur.319..751M. doi:10.1038/319751a0. ^ "The Structure of the Universe". doi:10.1007/978-1-4614-8730-2_10#page-2 (inactive 2019-03-05). ^ Mackie, Glen (February 1, 2002). "To see the Universe in a Grain of Taranaki Sand". Swinburne University. Retrieved December 20, 2006. ^ "Unveiling the Secret of a Virgo Dwarf Galaxy". European Southern Observatory Press Release. ESO: 12. May 3, 2000. Bibcode:2000eso..pres...12. Retrieved January 3, 2007. ^ "Hubble's Largest Galaxy Portrait Offers a New High-Definition View". NASA. February 28, 2006. Retrieved January 3, 2007. ^ Gibney, Elizabeth (September 3, 2014). "Earth's new address: 'Solar System, Milky Way, Laniakea'". Elizabeth Gibney. doi:10.1038/nature.2014.15819. Retrieved August 21, 2015. ^ "Local Group". Fraser Cain. Universe Today. May 4, 2009. Retrieved August 21, 2015. ^ Devlin, Hannah; Correspondent, Science (April 20, 2015). "Astronomers discover largest known structure in the universe is ... a big hole". The Guardian. ^ "Content of the Universe – WMAP 9yr Pie Chart". wmap.gsfc.nasa.gov. Retrieved July 26, 2015. ^ Livio, Mario (2001). The Accelerating Universe: Infinite Expansion, the Cosmological Constant, and the Beauty of the Cosmos. John Wiley and Sons. p. 53. ISBN 978-0-471-43714-7. Retrieved March 31, 2012. ^ Peebles, P.J.E. & Ratra, Bharat (2003). "The cosmological constant and dark energy". Reviews of Modern Physics. 75 (2): 559–606. arXiv:astro-ph/0207347. Bibcode:2003RvMP...75..559P. doi:10.1103/RevModPhys.75.559. ^ Paul J. Steinhardt; Neil Turok (2006). "Why the cosmological constant is small and positive". Science. 312 (5777): 1180–83. arXiv:astro-ph/0605173. Bibcode:2006Sci...312.1180S. doi:10.1126/science.1126231. PMID 16675662. ^ Carroll, Sean (2001). "The cosmological constant". Living Reviews in Relativity. 4 (1): 1. arXiv:astro-ph/0004075. Bibcode:2001LRR.....4....1C. doi:10.12942/lrr-2001-1. PMC 5256042. PMID 28179856. Archived from the original on October 13, 2006. Retrieved September 28, 2006. ^ "Planck captures portrait of the young Universe, revealing earliest light". University of Cambridge. March 21, 2013. Retrieved March 21, 2013. ^ Persic, Massimo; Salucci, Paolo (September 1, 1992). "The baryon content of the Universe". Monthly Notices of the Royal Astronomical Society. 258 (1): 14P–18P. arXiv:astro-ph/0502178. Bibcode:1992MNRAS.258P..14P. doi:10.1093/mnras/258.1.14P. ISSN 0035-8711. ^ G. 't Hooft (1997). In search of the ultimate building blocks. Cambridge University Press. p. 6. ISBN 978-0-521-57883-7. ^ Clayton, Donald D. (1983). Principles of Stellar Evolution and Nucleosynthesis. The University of Chicago Press. pp. 362–435. ISBN 978-0-226-10953-4. ^ Veltman, Martinus (2003). Facts and Mysteries in Elementary Particle Physics. World Scientific. ISBN 978-981-238-149-1. ^ a b Sylvie Braibant; Giorgio Giacomelli; Maurizio Spurio (2012). Particles and Fundamental Interactions: An Introduction to Particle Physics (2nd ed.). Springer. pp. 1–3. ISBN 978-94-007-2463-1. ^ Close, Frank (2012). Particle Physics: A Very Short Introduction. Oxford University Press. ISBN 978-0-19-280434-1. ^ a b R. Oerter (2006). The Theory of Almost Everything: The Standard Model, the Unsung Triumph of Modern Physics (Kindle ed.). Penguin Group. p. 2. ISBN 978-0-13-236678-6. ^ Onyisi, P. (October 23, 2012). "Higgs boson FAQ". University of Texas ATLAS group. Retrieved January 8, 2013. ^ Strassler, M. (October 12, 2012). "The Higgs FAQ 2.0". ProfMattStrassler.com. Retrieved January 8, 2013. [Q] Why do particle physicists care so much about the Higgs particle? ^ Steven Weinberg (April 20, 2011). Dreams of a Final Theory: The Scientist's Search for the Ultimate Laws of Nature. Knopf Doubleday Publishing Group. ISBN 978-0-307-78786-6. ^ a b Allday, Jonathan (2002). Quarks, Leptons and the Big Bang (Second ed.). IOP Publishing. ISBN 978-0-7503-0806-9. ^ "Lepton (physics)". Encyclopædia Britannica. Retrieved September 29, 2010. ^ Harari, H. (1977). "Beyond charm". In Balian, R.; Llewellyn-Smith, C.H. Weak and Electromagnetic Interactions at High Energy, Les Houches, France, Jul 5 – Aug 14, 1976. Les Houches Summer School Proceedings. 29. North-Holland. p. 613. ^ Harari H. (1977). "Three generations of quarks and leptons" (PDF). In E. van Goeler; Weinstein R. Proceedings of the XII Rencontre de Moriond. p. 170. SLAC-PUB-1974. ^ "Experiment confirms famous physics model" (Press release). MIT News Office. April 18, 2007. ^ "Thermal history of the Universe and early growth of density fluctuations" (PDF). Guinevere Kauffmann. Max Planck Institute for Astrophysics. Retrieved January 6, 2016. ^ "First few minutes". Eric Chaisson. Havard Smithsonian Center for Astrophysics. Retrieved January 6, 2016. 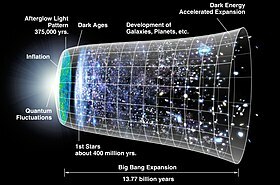 ^ "Timeline of the Big Bang". The physics of the Universe. Retrieved January 6, 2016. ^ a b c d Zeilik, Michael; Gregory, Stephen A. (1998). "25-2". Introductory Astronomy & Astrophysics (4th ed.). Saunders College Publishing. ISBN 978-0-03-006228-5. ^ Friedmann A. (1922). "Über die Krümmung des Raumes" (PDF). Zeitschrift für Physik. 10 (1): 377–86. Bibcode:1922ZPhy...10..377F. doi:10.1007/BF01332580. ^ Munitz MK (1959). "One Universe or Many?". Journal of the History of Ideas. 12 (2): 231–55. doi:10.2307/2707516. JSTOR 2707516. ^ Linde A. (1986). "Eternal chaotic inflation". Mod. Phys. Lett. A. 1 (2): 81–85. Bibcode:1986MPLA....1...81L. doi:10.1142/S0217732386000129. Linde A. (1986). "Eternally existing self-reproducing chaotic inflationary Universe" (PDF). Phys. Lett. B. 175 (4): 395–400. Bibcode:1986PhLB..175..395L. doi:10.1016/0370-2693(86)90611-8. Retrieved March 17, 2011. ^ Everett, Hugh (1957). "Relative State Formulation of Quantum Mechanics". Reviews of Modern Physics. 29 (3): 454–62. Bibcode:1957RvMP...29..454E. doi:10.1103/RevModPhys.29.454. ^ a b Tegmark M. (2003). "Parallel universes. Not just a staple of science fiction, other universes are a direct implication of cosmological observations". Scientific American. 288 (5): 40–51. arXiv:astro-ph/0302131. Bibcode:2003SciAm.288e..40T. doi:10.1038/scientificamerican0503-40. PMID 12701329. ^ Tegmark, Max (2003). J. D. Barrow; P.C.W. Davies; C.L. Harper, eds. "Parallel Universes". Scientific American: "Science and Ultimate Reality: From Quantum to Cosmos", Honoring John Wheeler's 90th Birthday. 288 (5): 40–51. arXiv:astro-ph/0302131. Bibcode:2003SciAm.288e..40T. doi:10.1038/scientificamerican0503-40. PMID 12701329. ^ Ellis G. F (2011). "Does the Multiverse Really Exist?". Scientific American. 305 (2): 38–43. Bibcode:2011SciAm.305a..38E. doi:10.1038/scientificamerican0811-38. PMID 21827123. ^ Clara Moskowitz (August 12, 2011). "Weird! Our Universe May Be a 'Multiverse,' Scientists Say". livescience. ^ Gernet, J. (1993–1994). "Space and time: Science and religion in the encounter between China and Europe". Chinese Science. 11. pp. 93–102. ^ Ng, Tai (2007). "III.3". Chinese Culture, Western Culture: Why Must We Learn from Each Other?. iUniverse, Inc.
^ Blandford R. D. (2015). "A century of general relativity: Astrophysics and cosmology". Science. 347 (6226): 1103–08. Bibcode:2015Sci...347.1103B. doi:10.1126/science.aaa4033. PMID 25745165. ^ Leeming, David A. (2010). Creation Myths of the World. ABC-CLIO. p. xvii. ISBN 978-1-59884-174-9. In common usage the word 'myth' refers to narratives or beliefs that are untrue or merely fanciful; the stories that make up national or ethnic mythologies describe characters and events that common sense and experience tell us are impossible. Nevertheless, all cultures celebrate such myths and attribute to them various degrees of literal or symbolic truth. ^ Eliade, Mircea (1964). Myth and Reality (Religious Traditions of the World). Allen & Unwin. ISBN 978-0-04-291001-7. ^ Leonard, Scott A.; McClure, Michael (2004). Myth and Knowing: An Introduction to World Mythology (1st ed.). McGraw-Hill. ISBN 978-0-7674-1957-4. ^ Donald Wayne Viney (1985). "The Cosmological Argument". Charles Hartshorne and the Existence of God. SUNY Press. pp. 65–68. ISBN 978-0-87395-907-0. ^ Aristotle; Forster, E. S.; Dobson, J. F. (1914). De Mundo. Oxford: The Clarendon Press. p. 2. ^ Nasr, Seyyed H. (1993) . An Introduction to Islamic Cosmological Doctrines (2nd ed.). 1st edition by Harvard University Press, 2nd edition by State University of New York Press. pp. 135–36. ISBN 978-0-7914-1515-3. ^ Misner, Thorne and Wheeler, p. 754. ^ Ālī, Ema Ākabara. Science in the Quran. 1. Malik Library. p. 218. ^ de Cheseaux JPL (1744). Traité de la Comète. Lausanne. pp. 223ff. . Reprinted as Appendix II in Dickson FP (1969). The Bowl of Night: The Physical Universe and Scientific Thought. Cambridge, MA: M.I.T. Press. ISBN 978-0-262-54003-2. ^ Olbers HWM (1826). "Unknown title". Bode's Jahrbuch. 111. . Reprinted as Appendix I in Dickson FP (1969). The Bowl of Night: The Physical Universe and Scientific Thought. Cambridge, MA: M.I.T. Press. ISBN 978-0-262-54003-2. ^ Jeans, J. H. (1902). "The Stability of a Spherical Nebula" (PDF). Philosophical Transactions of the Royal Society A. 199 (312–320): 1–53. Bibcode:1902RSPTA.199....1J. doi:10.1098/rsta.1902.0012. JSTOR 90845. Archived from the original (PDF) on July 20, 2011. Retrieved March 17, 2011. ^ Einstein, A (1917). "Kosmologische Betrachtungen zur allgemeinen Relativitätstheorie". Preussische Akademie der Wissenschaften, Sitzungsberichte. 1917. (part 1): 142–52.